It’s been a couple of years since we moved to our house, and bit by bit we are working our way through all the usual home improvements that will finally make it the home we are after. Painting has been our main focus lately, and we have just finished painting the dreaded hall, stairs and landing followed by the kitchen and utility room. Of course when I say ‘we’ I mostly mean my husband! Haha! Our utility room had a nasty old (dust gathering) venetian blind, and when this was removed during painting, I decided to crack on with replacing it with something much more lovely to look at. It’s only a small window, and not one which needs a functioning blind – it is at the back of our house and is not overlooked at all. I had my heart set on a false Roman Blind made from a piece of special Orla Kiely upholstery fabric from Dunelm. 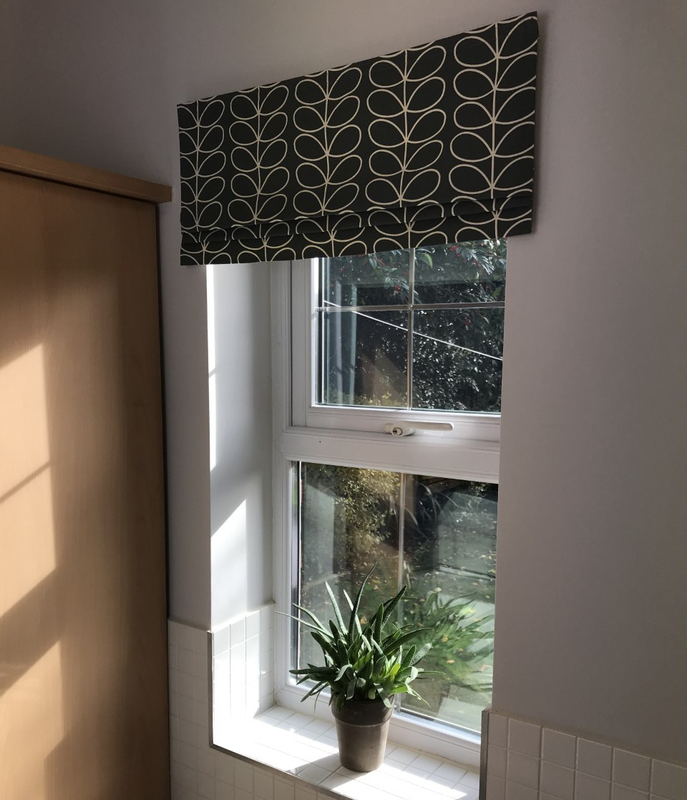 It’s a little pricey at £18 per metre, but decided that I might be able to get away with just a half metre as the fabric was plenty wide enough to cover the width of the window and as it wasn’t necessary to be a working blind, I could simply fold it where I liked to make the drop work. So a half metre of this fabric cost me just £9, which I didn’t think was too bad. The most important thing with this project is to be very precise with your measurements. I wanted this blind to sit just above the window recess, with a few cm ‘overhang’ either side. The window recess measurements are 58cm width and 112cm drop. I decided that I wanted the finished flat blind measurement to be 66cm in width ( that is the 58cm width of the window plus a 4cm ‘overhang’ each side of the recess). The drop length of the blind is 50cm ( i.e the half metre length that I purchased). To measure how wide to cut the Orla fabric, I knew I needed the width to be 66cm (width of the finished blind), plus a 1cm seam allowance each side = 68cm. I then wanted there to be a narrow vertical ‘border’ of the Orla fabric on each side of the reverse of the blind where it attaches to the lining fabric. This ‘border’ measures 2cm each side, so the total width that I needed to cut of the Orla fabric was 72cm. The lining fabric then needed to be cut. I just used some cream curtain lining that I had in my stash, but I’m pretty sure this wouldn’t be too expensive if you had to buy a small amount. The lining needs to be measured to be slightly narrower than the Orla fabric, as this will allow the Orla fabric to create that lovely ‘border’ on the reverse of the blind that I mentioned previously. So, the lining is calculated as the finished width of the blind (66cm) minus the 2 lots of 2cm borders =62cm, plus 2 lots of 1cm seam allowances = 64cm. So, to clarify, I cut the Orla fabric at 72cm width, and the lining at 64cm width. This way ensures that when they are sewn together that a nice grey border will run down each side of the wrong side of the blind. This shows the cut lining and how it is a little narrower than the grey Orla fabric beneath it. With such precise measurements, it is essential to press your fabric before cutting. I trimmed off the smallest amount of fraying fabric at the top and bottom of my blind (where the fabric had been cut), and I also positioned the design so that the centre line of one of the stem rows would be running down the exact centre of the blind. Now to get sewing! Firstly, with the right sides together, I pinned and sewed both side seams. Because the Orla fabric is wider than the lining, you will have a little extra ‘lump’ of fabric when you pin the sides. When you have sewn down either side of the blind, smooth that ‘lump’ of Orla fabric so that the vertical seams on the back of the blind are evenly 2cm from the edge of the blind. Don’t iron it yet. Before you turn it right side out, pin along the bottom edge and sew this up. Again I used a 1cm seam allowance to preserve what little length I had. Apologies for the lighting. It was a sunny day when I took these pictures, but I hope that you can still see what I am trying to show you! You can then trim this seam allowance, clip the corners and turn the blind right side out again. Use a point turner or something similar to ensure the corners are nice and sharp and give it a good press. More sun and shadows – whoops! You can see from the image above that I then pinned the open top edge together. I neated these edges together with the overlocker. Next it’s time to attach the velcro strip to the top of the blind. The velcro strip that I used is 2cm wide, so I turned over the top edge by 3cm, pressed it, and pinned and sewed the fluffy side of the velcro along the middle of this turn-over. Next, it is time to pleat your blind. This is done purely on your personal preference. I wanted 2 or 3 folds, and I also wanted to pattern match the stem design too. Take into consideration the height that you will attach the wooden batten to the top of the window too. When you are happy with the finished folded blind, give it a good press. In addition to pinning it in place, it is a good idea to run some temporary lines of tacking along the folds so that it doesn’t droop whilst you are finishing it off. I also permanently hand stitched the folds at each side of the blind, and also at various intervals along the folds at the back of the blind. Remove your tacking stitches. The wooden batten that we used to attach the blind to the wall was just a leftover that we had in the garage. Again, when I say we, I mean my husband! He cut it to just short of the 66cm blind width – probably approx 64cm – so that it wouldn’t show at all when the blind was in position. He then stapled the prickly part of the velcro to it, and screwed it to the wall a few centimetres above the top of the window recess. The blind simply sticks to the batten now, with the velcro, and there you have it! Easy! I do hope that this might help you if a false Roman Blind is something that you are planning. With the Festive season just around the corner, I am getting in the spirit of things by entering a fun competition that has been arranged by Tilly and the Buttons. The ‘Sew A Xmas Sweater’ challenge is to sew up and decorate any Tilly and the Buttons sewing pattern to wear during the holiday season. If you would like more details about the competition then you can find out all about it here. It was tricky to choose which pattern to make. As you can see from previous blog posts, I am a huge Tilly fan, and have made lots of her patterns, but eventually I decided that I would make another Frankie baseball t-shirt. I have blogged about this t-shirt here, so you can check that out if you are new to this pattern, but this post is going to concentrate on how I embellished it. My fabric choice is a lovely cotton interlock jersey which I picked up from eBay. 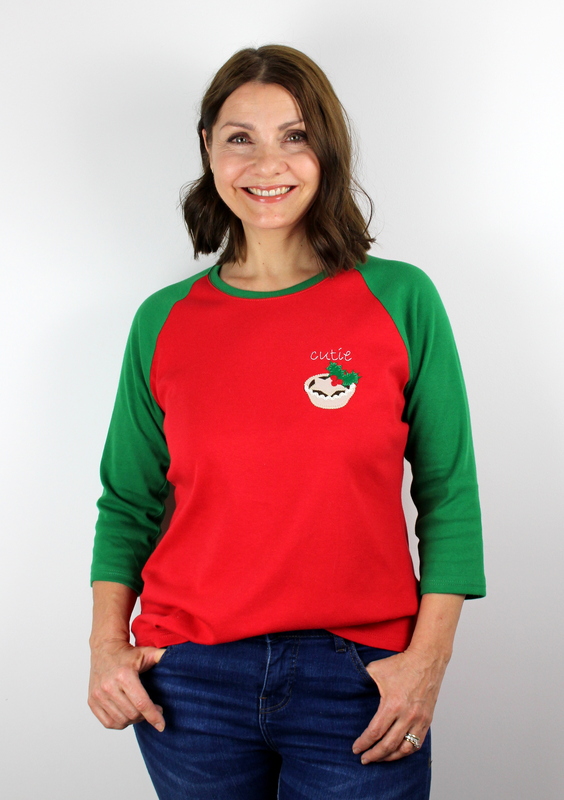 It’s full-on festive red and green, but if you wanted to tone it down a bit you could choose a white or cream fabric for the main body and just have red and green for the sleeves and neckband. To make the mince pie, I used a machine applique technique using Bondaweb iron-on transfer fabric that I had been taught when attending an applique class at the Leicestershire Craft Centre back in January. I searched out an image of a mince pie that I liked on the internet, printed it off, and traced out the key shapes using tracing paper. I then traced out these shapes on to the smooth side of some Bondaweb fabric and cut around these shapes roughly. Iron these roughly cut out shapes onto the wrong side of your chosen fabric (or in my case, felt), and then cut around the outline carefully and neatly. You are left with the perfect shapes to create your layered design that now have the Bondaweb applied to the back. As you can see, I also had some cream ric rac tape which has a gold thread running through it which I thought would make the perfect pie crust, so I cut a strip of this too. An important thing to mention is that it is crucial to apply any applique on to your top bodice before the underarm and side seams have been sewn. This way you are sewing on the flat and it makes your life much simpler! Tilly actually recommends doing this in her ‘Stretch’! book (page 91), and she also runs through exactly the procedure that I am using here too. So I carried out the whole of this applique procedure before I started any sewing on my t-shirt. The placement of your applique is also very important. Luckily I have already made the Frankie t-shirt before, so I simply popped it on, worked out where I wanted my design to sit, and pinned it carefully in place. I was then able to work out exactly where to position it on my festive version. As I am embroidering some wording on the top, I also pinned that in position – but I’ll talk about the embroidered wording later in the post. As you can see from the image below, I was originally going to use scrap fabric pieces for the mince pie, but finally decided to use felt. I removed the peel-off backing from the back of my shapes and ironed them into place. I’m pretty sure that I have read somewhere that this is enough to hold your design in place just as it is, but I wanted to add a machine blanket stitch around the edges to make super sure that it stays in place and also to add to the decoration. At this point I cut some Stitch-n-Tear and pinned it to the wrong side of my fabric to give it some support and stop it from puckering or stretching when I was machine stitching it. I cut it large enough that it would also be in place ready for when I hand embroidered the wording above the mince pie. In the image above you can see the back of the pins that are holding the stitch-n-tear in place behind the design. After testing out your stitch size on a scrap of spare fabric, I used a machine blanket stitch around all the edges. This is such fun, take your time with it – it’s worth it. I also cut the ric rac to the correct length, applied some Fray Check to the raw ends, and stitched that in place too. Below shows what it looks like on the wrong side after stitching. You might notice that I hand stitched the red berries. I hope that how I have written this will make some sense. There are lots of video tutorials on the internet when you search ‘machine applique’ if you need some visual guidance. Next to apply the wording. I remember that I had watched a great tutorial from Sophia from JessalliHandmade on YouTube a few months ago. I followed this tutorial exactly to create the wording that I wanted and I am really pleased with how it turned out. In brief, you print out whatever wording you want in several different sizes and when you are happy with the font and size, you trace it out on some more stitch-n-tear. As you can see I was torn between making it a sweetie-pie or a cutie-pie slogan! Place the stitch-n-tear with your traced design where you want it, and pin it into place. Then, using a simple back stitch and embroidery thread, sew over your wording and carefully peel it away when you are finished. Simple! There you have it! At this point I just made the t-shirt according to the instructions as normal, and the finished result is really satisfying. Ooh, and don’t forget the finishing touches! The ‘Sew a Xmas Sweater’ contest is open until December 9th, so there is still plenty of time to get sewing if you feel like giving it a go and having a bit of fun. Do head over to the blog post on the Tilly website that I linked at the start of this blog and it will give you all the terms and conditions as well as a look at the FAB prizes that are up for grabs too! I am looking to seeing lots of fun sweaters cropping up on Instagram over the next couple of weeks (the hashtag to look out for is #SewingXmasSweater). During the month of July, the British Heart Foundation are running a fun challenge where you can pop over to your local BHF shop, purchase an item of clothing, therefore supporting their charity, and then have a bit of fun altering it and adding your own fashion flair to it! Off I went to my local BHF shop in Silver Street, Leicester, and selected a white top with black spots for the bargain price of £2.79. After running it through the wash, I took a good look at it and decided what I wanted to do. I knew I needed to take it in at the sides, shorten the sleeves, and maybe take a strip from around the bottom and gather it before sewing it back on. I also knew that I wanted to use some pretty floral bias tape from my sewing stash that I had made some time ago. First things first, and this was brutal, was to work out how much I needed to take in from the sides and pin and mark it and simply cut the excess away! I also measured how much I wanted to take off the length of the sleeves and cut those to length too. At the same time I removed a strip from around the bottom edge and gave that the chop too! After all that cutting, I re-pinned the side seams and simply sewed them back together again. It really was that easy. I did not need the sleeve or side seam offcuts, so these were discarded. Next task was to overlock the bottom edge of the top. I also overlocked was the raw edge of the band that I had cut from around the bottom. Because the top was now a little narrower, this gave me a little length in this strip to gather it slightly and re-attach it, making a gentle ruffle around the bottom edge. Finally, to finish off the neckline, I chose to edge it with some pink floral bias tape. I made this using scrap fabric from my stash using this tutorial. Whilst I was at it, I thought I might as well edge the sleeves with the bias tape too! Simple, quick and easy, the whole thing took me about 45 mins. This has been a fun way of taking a pre-loved item and making it your own. I am pleased that a top that I would have previously passed by, is now something that I can reach for and feel confident in. 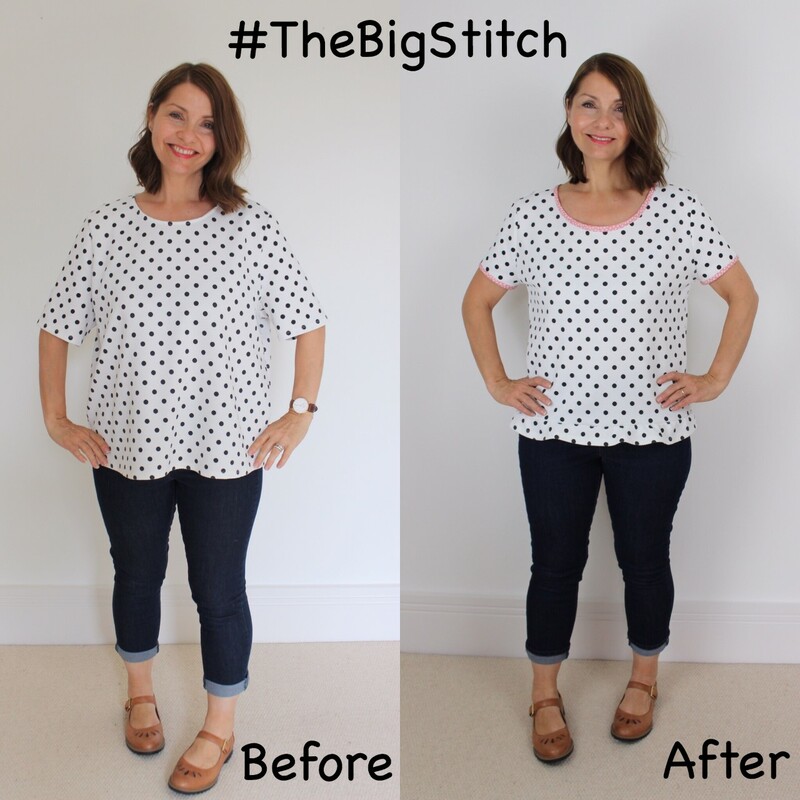 Have you taken part in the #TheBigStitch challenge? Or perhaps re-fashioned an old item of clothing? As always it would be lovely to hear from you. 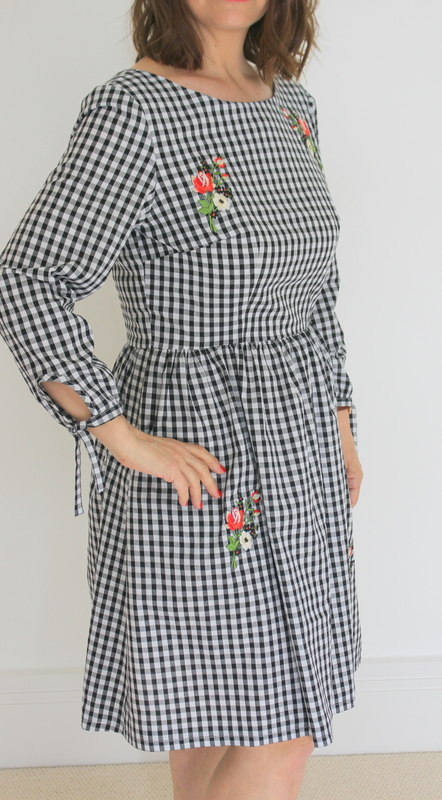 In my last post, I talked about my thoughts on the Christine Haynes Emery Dress sewing pattern and how I changed the regular sleeves to these tie sleeves in order to recreate a pretty dress that I had spotted on the High Street. I have had so many lovely comments about it on social media that I have decided to write a separate tutorial on how I made these sleeves. Straight off I want to say that this is how I made these sleeves, I’m not saying it’s the right way, or the only way, or the best way – it’s just my way! If you would like to read my full review on the dress, and see the High Street dress that I took inspiration from you can click here. Firstly, I made the dress as normal, until I came to the sleeves. I cut out the regular long sleeves exactly to the pattern and pinned them to my finished bodice so that I could get an idea of how they would lay when stitched. I put on the bodice and pinched the ends of the sleeves around my wrist – I wanted to see if the cuffs would sit tight around my wrist or if there was room for some gathers. Luckily there was some room to allow for the gathers that I wanted ( I have small wrists ), so I didn’t need to change the sleeve shapes at all. In order to prepare the sleeve we need to make a ‘keyhole’ cut out in the bottom of each sleeve. To do this I folded each sleeve in half longways, right sides together, so that the long sleeve edges lined up. I marked a point 8cm up from the bottom of the sleeve, on the fold, with tailors chalk. At this time I also marked the fold point at the bottom edge of the sleeve. I then opened out the sleeve and used a ruler to mark a straight line from the top marking to the bottom (8cm long). On the bottom edge of the sleeve, I marked a point 1.5cm either side of the line I had just made. Next I drew a curved line, (freehand), from the top point to one of the 1.5cm markings at the bottom. Re-fold your sleeve back in half again, pin to stop it from slipping and cut out your ‘keyhole’ shape. Repeat these steps for the other sleeve – I used my cut-out as a template for the second sleeve. To bind the edges of the ‘keyhole’ openings you will need 2 lengths of bias cut fabric, each measuring at least 30cm. I used scrap leftover fabric, but you could use shop bought bias binding tape. I cut each of my strips 3.5 cm wide and this meant that they would run nicely through my 18mm bias tape maker. They were also the exact width of my ruler which made things super easy! Now it’s time to attach the bias strips to the raw edges of the ‘keyhole’ shapes you have just cut out. Before you start it helps if you iron/press the bias tapes into a curved shape. This really helps you attach more easily. Unfold your bias tape and pin it right side down to the wrong side of the sleeve around the ‘keyhole’ opening keeping the edges of the tape against the edges of the ‘keyhole’ opening. Use plenty of pins to keep it secure. Upon reflection it would probably be better to attach the bias to the RIGHT side of the sleeve – further into the tutorial I will explain why! Take to your machine and sew in place all around the edge along the fold line of the bias tape. When sewn into place, snip the seam allowances carefully to enable it to lay flat when finished. Turn the tape through to the other side of the sleeve, encasing the raw edge of the ‘keyhole’ and pin into place on the other side. Stitch neatly into place close to the edge of the bias tape, and trim the ends off. Give it a good press with the iron. At the end of both sleeves I ran 2 rows of gathering stitches, in preparation for later, then made up the sleeve tube by placing the long edges together, right sides facing each other, and stitched along this edge. I neatened the raw edge and pressed it. I pinned the sleeve to the bodice of the dress again to get an idea of where the end of the sleeve would sit. I then pinched it to fit my wrist and decided that I had about 5-6cm that I could gather it in by. With a tape measure I measured around the ungathered bottom of my sleeve. It measured approx 25.5cm. I then knew that I could gather up 5-6cm so when the gathers were pulled the sleeve opening would measure approx 19cm in length. I then pulled the gathering threads on each sleeve so that the opening measured approx 19cm long. I then placed these to one side for a moment. Next we need to make the tie/cuff band. For this I needed 2 lengths of fabric cut straight along the grain of the fabric which measured 55cm x 5cm. To prepare the sleeve cuff/ties, fold the strips in half lengthways with the right sides together. What you need to do is sew them into a tube, leaving a large opening of whatever the length of your gathered cuff is – in my case 19cm. To be on the safe side your opening should really be slightly larger than your cuff length to make it easy for yourself. I left an opening of approx 21cm. I hope in the photo below you can see from my chalk markings where I sewed. The area between the central pins is that gap of approx 21cm – from each central pin I stitched away in each direction to the end, pivoted the needle and sewed down to the fold. When all sewn up, snip the corners, trim the seam allowances and turn right sides out. I used a blunt chopstick to do this. Tuck in the seam allowances at the opening that you left and give it a good press. Slip your tie/cuff over the raw edge of the sleeve, encasing the gathered raw edges of the sleeve in the opening that you left in your cuff piece, and pin it into place. Take to the machine and sew neatly as close to the edge of the cuff as you can. There you have it – a regular sleeve converted into a tie sleeve. I do hope you may have found this helpful. I know it may not be the correct or easiest way but it is the way that I found worked for me, and I am thrilled with the results. Do head on over to my previous blog post to see the pictures of my finished make and the High Street dress that gave me the inspiration to make this adjustment to the sleeves. I would welcome your comments, and look forward to hearing your thoughts. 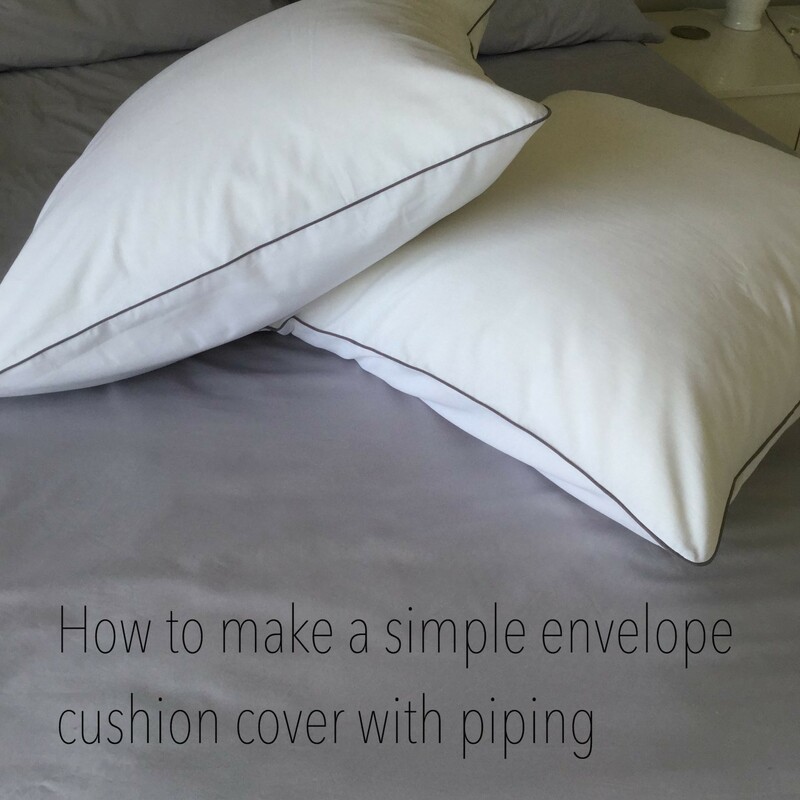 How to make simple envelope cushion covers with piping. A little while ago, whilst browsing through Pinterest – as you do in the middle of the night – I came across some pictures of some really pretty bedding ideas, and how to arrange your pillows. I immediately decided I NEEDED 2 very large white square cushions to place at the back of the bed and immediately the room would be given that fancy hotel feel! Upon further investigation of snazzy pictures of how to dress your bed – there are lots of them – I decided that they had to be dazzling white with grey piping, to match our newly decorated grey bedroom. Originally I wanted to use a white waffle fabric, but soon realised that this would be quite costly, so opted for the budget friendly option of using a plain white bed sheet as I couldn’t bring myself to spend a great deal on plain white fabric. Life’s too short. My cushion pads were from Dunelm and were the largest I could find at 26″ square. The bed sheet was from Primark and was a single flat sheet which was perfect for my project. Cushion pad/s to the size you require. Mine are 26″ square. Fabric ( I simply used a plain flat bed sheet, your choice could be a great deal prettier than this)! Bias Piping Tape ( I bought ready made tape, but of course you could make your own. Rotary cutter and mat, and/or fabric scissors. Pins and/or Clover Wonder Clips. Zipper foot for your machine. As you can see from the pictures, I made two cushion covers. For the purposes of this tutorial I will be describing how to make one cushion cover. Your cushion cover is made up using one square of fabric – which will be the front piece of the cushion cover, and two smaller rectangular pieces – which make the back of the cushion cover. I will be using a 1/2″ seam allowance for this project. The first thing I did was to take both rectangular pieces of fabric and neaten one of the 27″ edges on each of them. I turned the edge over 1/2″ and pressed it, then turned another 1/2″ again, and stitched along this edge. You can put these to one side for now. Next take the square piece of fabric and lay it down with the right side up. Pin or clip the piping tape around the entire edge. I am going to be using a 1/2″ seam allowance for this project so I make sure that the stitching on the piping runs along the edge at this distance. The piping should bend nicely around the corners. To help, snip the piping tape at the corners taking care not to snip too far! Your length of piping will need to be long enough to run all the way around your square and 2 or 3 inches extra at each end to allow for overlapping/joining the binding where it meets up. Make sure the piping join meets along one of the straight sides, it would be tricky to do this on a corner. To join them together firstly unpick a few stitches on the piping and open the casing up to reveal the string/cord inside. Cut the string/cord approx 1″ shorter and then fold back the casing to the inside so that you have a neat edge of the end and the string/cord cut just a little shorter than the folded end. I hope you may be able to see this from the picture below. Next, (again please refer to the picture below), with the other end you will need to cut the piping tape straight up so that it lines up with the end of the string/cord that you just cut on the previous piece. Again looking at the picture for reference, the right hand tape will now sit nice and flat inside the left hand tape. Simply fold the left hand tape over the top of the right and pin/clip into place. To make sure that your piping tape doesn’t slip or move, I decided to baste it into place. I used grey thread and stitched it to to the fabric. I used the zipper foot on my machine to make it easy for me, but I wasn’t trying to stitch close to the piping – in fact quite the opposite. This is only to hold it in place, it is when you sew it all together at the end that you need to stitch super close to the piping. Finally it’s time to sew the front piece with the attached piping to the two back envelope panels. Place the square front piece with the right side up. Then place the two rectangular back panels on top, right sides down, with the raw edges of the rectangles meeting the raw edges of the square piece. They should overlap, and this is what give you the envelope opening. I hope this is clear, unfortunately my cushion is so large it was difficult to photograph this step! Pin/clip into place and then, using your zipper foot sew in place all around the edge – this time sewing as close to the piping cord as you possibly can. This will ensure that when you turn it right side out that only the cord is visible and not the tape that it is attached to! When you are stitching it is wise to reinforce the edges of the cushion cover where you will open and close it, with extra stitching to give it a bit of extra strength. Turn your cushion cover right side out and give it a gentle press, ensuring the corners are gently pushed out. I hope that you follow this tutorial, it was tricky to photograph such a large project so I hope my written description makes sense when pictures weren’t possible! The finished result is great and I feel our bedroom is almost complete now. Have you made any home furnishings recently? I would love to hear how you got on. Let me know if you have a go at these cushion covers too, tag me on social media so I can see your work! Back in December I showed you how to make fabric Christmas tree bunting, and now that we are a week away from Easter I thought I would adapt this to make some cute Easter bunny bunting. If you would like to check out my previous post on how to make Christmas tree bunting you can do so here. I have made very few changes (apart from the shape)! except this time I decided not to ‘pad’ them out using wadding or interfacing as I wanted to keep them as light-weight as possible. I wanted to keep this tutorial simple, so your supplies are probably things that you already have in your sewing stash – apart from perhaps the pom poms. I purchased these from The Range in the children’s craft dept. for £1.99, but you could make your own if you have spare yarn and a snazzy pom pom maker or your own template. Or of course you could use cotton wool balls. Fabric scraps. I chose pastel colours as they reminded me of Spring. Any bunny template. There are lots of free templates available on the internet. Bias binding or tape to use as the string for your bunting. Fabric scissors and pinking shears. Pom poms, or cotton wool balls. Let’s go! To start with you need to cut out your fabric a little bit bigger than the size of the bunny. Each bunny requires 2 pieces of fabric. Place the 2 pieces of fabric together, with the wrong sides facing, and pin the bunny template on the top. Take this to your sewing machine and carefully sew around the bunny shape as close to the edge as you can. 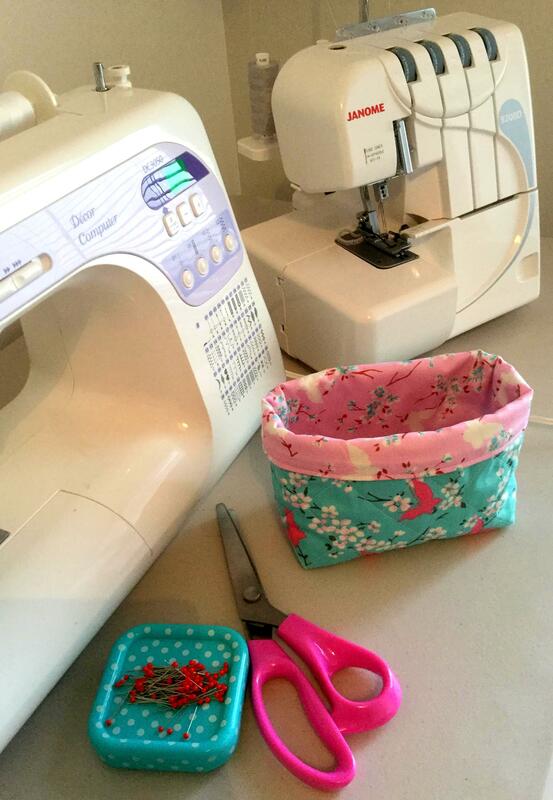 Remove your pins and cut around the edge with your pinking shears taking care not to snip your line of stitching. Repeat this process for as many bunnies as you want! Decide how long you would like your bunting to be and cut a length of bias binding or tape to that length, you may want to allow a little extra to make loops at each end. I did this. I pressed my tape in half lengthwise as this makes it much easier when it comes to sewing it. Evenly space your bunnies along the tape and encase the tops of their ears inside the fold of the tape. Pin in place. 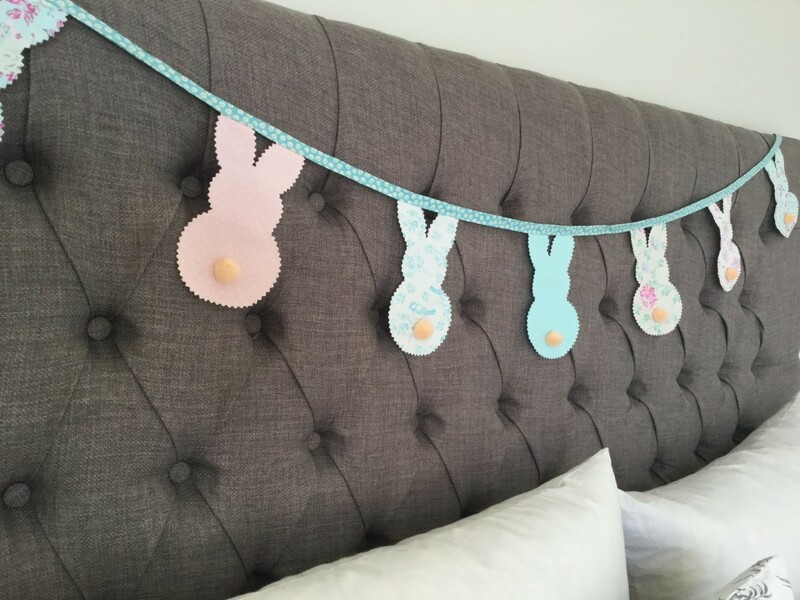 Now all you need to do is take your bunting to your machine and stitch along the whole length of the bunting making sure that the ears of the bunnies don’t slip out and are caught inside the tape as you stitch. You can turn each end under to make a hanging loop whilst you are stitching. Now the fun part. Use your glue to pop a little pom pom tail on each of the bunnies. You could use a few hand stitches if you prefer, but do this whilst your bunnies are still single layer then your stitches won’t show on the back when it’s hanging. You’re all done! If you can bear it, it’s a good idea to try to leave it whilst the glue dries before hanging. I wouldn’t want you to lose your tails. Show off your bunting wherever you like, I’m sure it will be admired! I’m always on the look out for a project that will use up the small scraps of fabric that are lurking in my fabric stash. This is a good one. 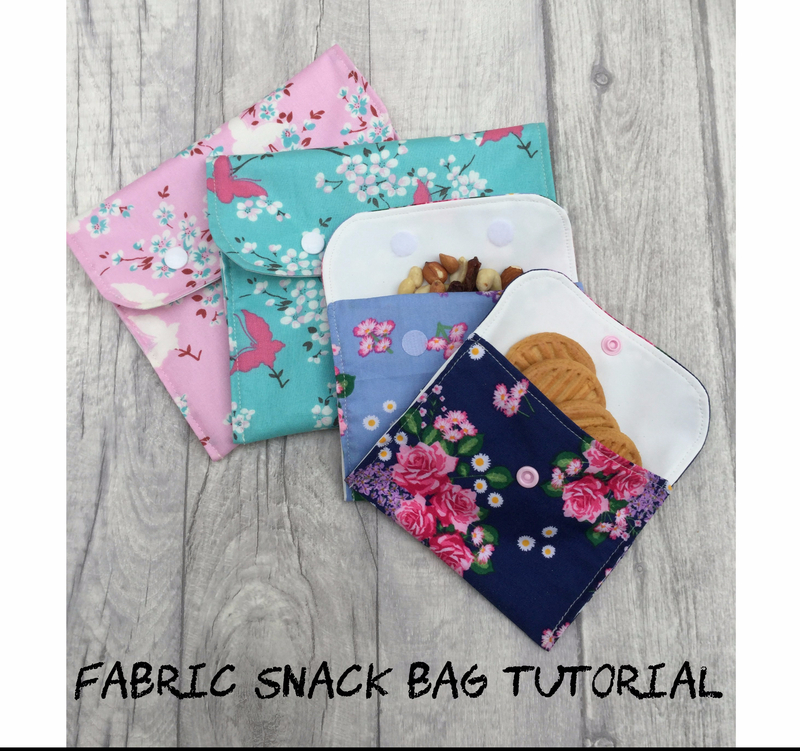 These fabric snack bags are lined with waterproof PUL fabric so are practical and washable. If you don’t have PUL or prefer not to use it, and do not require your bags to be waterproof, then they could easily be lined with another piece of fabric. They are also very quick and easy to make, and I think look pretty cute too. I have made these bags in two sizes, and have chosen different fastening choices. Fabric scraps. For the large bag you will need one piece of outer fabric measuring 40cm x 20cm, and one piece of PUL or other lining fabric measuring 40cm x 20cm. For the small bag you will need one piece of outer fabric measuring 30cm x 15cm and PUL or other lining fabric measuring 30cm x 15cm. Fabric scissors, or rotary cutter and mat. Fastenings of choice. I have used Velcro dots and KAM snaps. Point turner or something similar like a knitting needle or chopstick . Clover wonder clips or pins. Cup, glass or plate to trace a curved edge. To start, I cut my fabric and lining pieces. I have cut enough pieces here to make 2 large bags and 2 small bags. So that the flap of your bag has neat rounded edges I used a coffee cup to trace a curved edge on two of the corners of each outer fabric and lining fabric piece. You will only need two rounded corners on each piece. Leave the remaining two corners as they are. See pic below. Place your fabric pieces and lining pieces together with the right sides facing. I clipped these in place using wonder clips as I didn’t want to puncture the PUL using regular pins. The clips do a really good job at holding everything in place. Next you will need to sew all around the edge leaving an opening of approx 4cm so that you can turn it through to the right side. I used a 1cm seam allowance. After stitching, I like to give it a good press to set the stitches in place, take care though to use a pressing cloth so that you don’t melt the PUL! Clip and trim the edges so that it will lay nice and flat when turned. Turn your bag right side out now, and use a point turner or something similar like a knitting needle or chopstick to get a good sharp point on those corners. Again careful pressing with the iron at this stage is helpful. You don’t need to sew the opening closed, just turn the seam allowance at the opening inside and press into place. Fold your bag over and decide how deep you want it making sure to leave enough room for your flap to fold over and your flap fastenings. You will probably want to turn it up about 3/4 of the way. Clip or pin in place. You are then ready to stitch all around the edge of your bag. I used a seam allowance of approx 0.5cm for this. Start at one of the bottom corners of the bag and stitch up the side, around the curved edges of the flap and down the other side edge. We are now ready to attach your fastening of choice. I have used Velcro dots for this bag, but later on you can see what they look like using KAM snaps too. To make sure your Velcro dots line up, close your flap and place pins in where you want the dots to sit. The pin will pierce the flap and the bag below and at this point you can simply peel off your Velcro and place where the pin hole is. Your Velcro dots will perfectly line up. I used two dots for each bag. You could use more, or use a strip of Velcro too. For my second small bag I used two KAM snaps as fastenings. I love how these looked, and decided to use the snaps as the fastenings for my larger bags too. On the darker blue bag I added a line of stitching across the straight edge before stitching the bag closed all the way around. Just for fun, (and because I never use the fancy stitches on my machine), I added a decorative stitch along the straight edge on the larger bags. I did this before I stitched the bag together all the way around the outside edge. There you go, a pretty way to carry your snack with you when you’re on the go. You could definitely play around with sizes, I have suggested 2 sizes here, but if you need different dimensions then go for it! These bags are simple and quick to make and could be used for lots of things, not just snacks. What would you use one for? Make up? Pens and pencils? Store cards? Or maybe stick to biscuits. Yes, definitely biscuits for me! Hope you have enjoyed, I welcome your comments. At the end of last year I noticed that @ute_ig and @sanaeishida on Instagram were hosting their 4th #2017sve – a wonderful secret Valentine exchange opportunity where you submit your details over to them and they secretly let you have the details of someone to make a handmade item for. I have never taken part in this before but as soon as I saw it I was all over it! When you receive details of your Valentine swap, it is up to you to try to do a bit of detective work to tailor your gift to their taste. I noticed that my partner enjoyed recipe writing, so decided to make her something that she could use in the kitchen. The oven glove and pot holders were fairly simple to make, and I was pleased with the outcome. My partner had divulged that she liked blues and grey and simple geometric shapes so although the idea of this swap is that you use fabric and items that you already own, I popped to the local fabric shop as I didn’t really have any fabric at home which met her criteria. I chose 3 coordinating pieces of Gutermann fabric from their ‘ring a roses’ range. I pre-washed these fabrics before sewing as I didn’t want any shrinkage after they were made. You will also need some heat resistant wadding for this project rather than regular wadding. The measurements for this project came from me simply measuring my existing oven glove and pot holders. You can of course adjust the sizes as you wish, but I was happy with the size that I was already using. 2 squares of heat resistant wadding measuring 20cm x 20cm. I started with the rectangles first. You will need to ’round off’ the corner points of each of your rectangular fabric pieces and your rectangular wadding piece. To do this simply place a small plate or saucer on each corner and mark the curve and cut to shape! Place one of the rectangular fabric pieces right side down on the table, then place the rectangular wadding on top of that. Finally place the other rectangular fabric piece of the top, right side up. Clip in place using your Clover clips or regular pins. You will need to machine quilt these layers together. I wanted to keep this simple and just wanted a nice grid of criss cross diamond shapes (there is probably a word for this design in the quilting world that I don’t know about)! So I marked one 45 degree line in the centre of the rectangle in one direction and one 45 degree line in the centre of the rectangle in the other direction. I simply sewed these lines in place on my sewing machine using my walking foot. I then used the L shaped bar attachment that comes with the walking foot as a guide to make sure all my other lines of stitching were equally spaced and parallel. I also think it is a good idea to start in the centre of your project and work outwards. This was probably the most time consuming part of the whole project, but very rewarding when you are finished and left with beautiful neat rows of stitching. Next we need to repeat what we have just done with our square pieces of fabric. These will ultimately be the ‘gloves’ of the oven glove. Layer up the squares in the same way as you did for the rectangles. You will have 2 separate squares to quilt this time. Clip or pin them together and use the same plate or saucer to trim 2 of the corners from each square this time – do not round off all 4 corners on these pieces! – just 2 on each square. 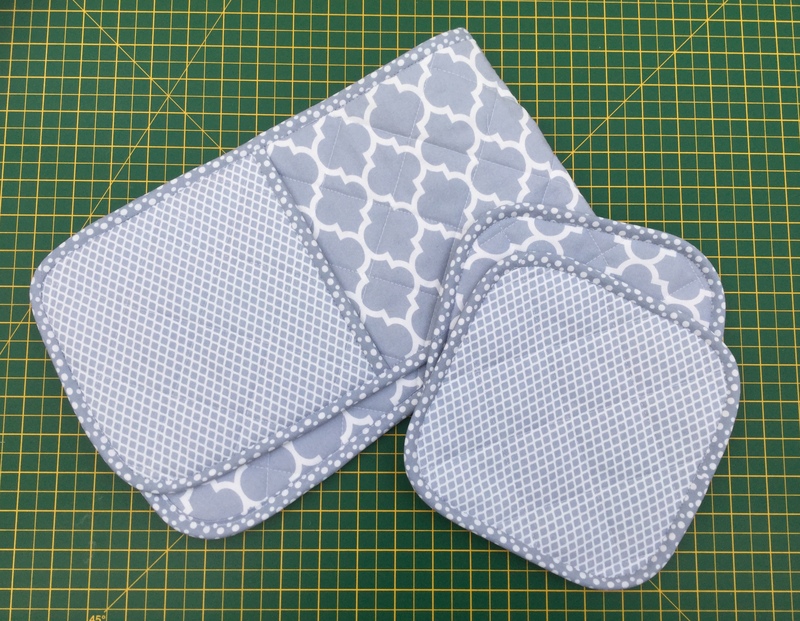 Take your square pieces and take them to the sewing machine. Machine quilt in the same way as you did for your rectangular piece. Next we want to add bias binding to your square pieces along each of the straight edges – i.e the edge between the corner points that you didn’t round off. See pic below for reference. This will be the opening edge of the ‘glove’ of the oven glove that your hand slips through each time you put on your glove. Open out your bias binding and place the edge of the bias against the edge of the glove piece, right sides together. Pin or clip in place and sew along the crease of the binding. Fold the bias binding right over to the other side – you may need to trim your seam allowance a little, and clip/pin in place making sure that the edge of the bias binding covers the line of stitching that you have just sewn. Take them back to the machine and ‘stitch in the ditch’ along the seam you have just sewn. You will be left with a neat line of stitches on the back of the binding. Pictured below you can see the front and back of the bias after stitching. Trim the ends of the bias binding neatly in line with the edge of the glove. Nearly done now! Place one ‘glove’ piece at each end of the long rectangular piece and pin/clip in place. To make extra sure these stay in place and do not slip it is a good idea to stitch them in place around the edge using a teeny tiny seam allowance. Finally we need to run the bias binding all around the long edge to ‘seal in’ the remaining raw edges and give it a really lovely professional finish. Attach the bias binding to the edge in exactly the same way as you did before and sew in the crease of the binding all the way around the long edge. Start/finish your stitching on a straight edge rather than at a corner. Don’t worry about the corners, the binding will easily stretch around these curves. Fold it over as you did before and ‘stitch in the ditch’ to secure and you are done! Easy! Firstly you will need to layer up your 2 pot holders. Each piece should have 1 square of pretty fabric at the bottom with the right side facing down, then on top of that goes the heat resistant wadding, finally on the top the other piece of pretty fabric with the right side facing upwards. Again just as for the main piece of the oven glove you will need to clip or pin these and round off all four corners using your saucer/plate as a guide. Do this with both pot holders. Again we will machine quilt this by marking one 45 degree angle in one direction and another 45 degree angle in the opposite direction. Sew along these lines using the walking foot on your machine if you have one and use the L shaped bar attachment that comes with the foot to make sure all further rows are perfectly parallel. It is easier to start in the middle of the squares and work outwards. After this you are nearly there! If you want to you can stitch around the entire edge of the squares to keep your edges stable. If you choose to do this use the smallest teeny tiny seam allowance as you don’t want your stitches to show after you have edged with the bias tape. To edge your pot holders with bias binding tape, simply open up the bias tape and place the edge of the tape against the edge of the pot holder with the right sides facing. Pin or clip in place, and simply stitch all the way around keeping in the crease of the bias tape. It is easy to start/finish along a straight edge. Don’t worry about the curved edges, the bias stretch of the tape will easily accommodate these curves. When you are done, simply fold the bias tape all the way over to the other side – you may want to trim your seam allowances to enable it to lay flat, and pin/clip the bias tape on the other side making sure it covers the row of stitching that you have just sewn. ‘Stitch in the ditch’ all the way around, and there you have it! Couldn’t be easier! It’s fun to use different fabrics for each side! I thoroughly enjoyed making these items for my #2017sve recipient. I do hope that this may have inspired you to have a go too. They are a fairly simple rewarding make and a great gift idea for all sorts of occasions as well as a treat to yourself. I think you may like to see the beautiful gift that I received as part of this exchange. This pretty bag which has a super practical waterproof lining was made for me by Ann at www.sewwatts.wordpress.com and I love it! Isn’t the floral fabric the cutest? Thank you Ann, you have me down to a tee! Let me know how you get on, and if you are going to make these! I love a bit of handmade bias. I have made lots and lots of it over the years. Up until recently they were all for dressmaking and accessories. But last week I used some handmade bias to bind the edge of my first handmade quilt – blog to follow. 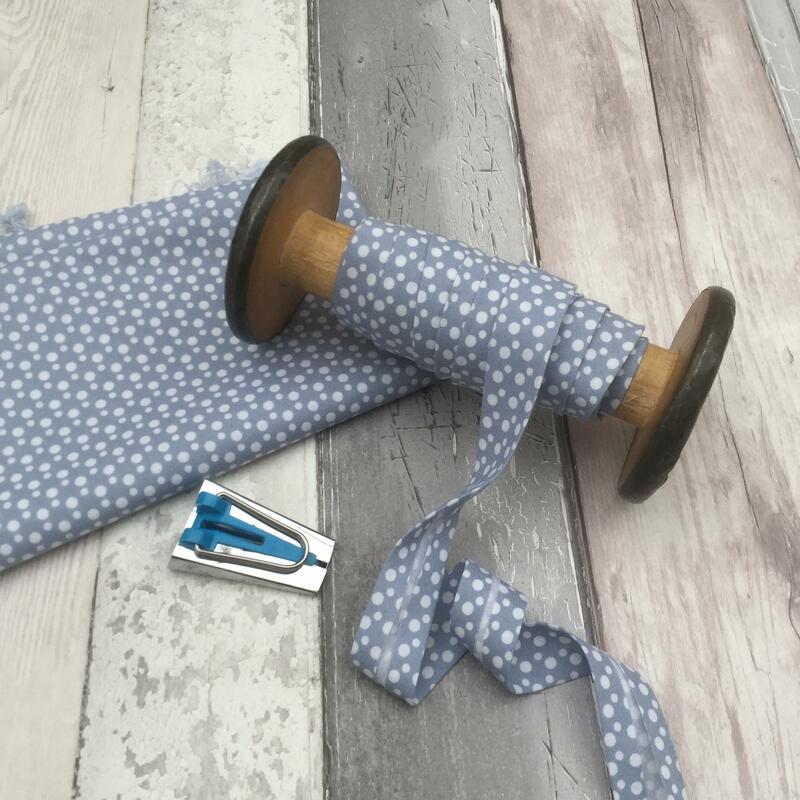 Whilst it is fairly easy to make by just cutting diagonal strips of fabric and sewing them all together, there is an easy way to make a long continuous strip simply with just two seams of sewing and a bit of clever marking out and cutting. Let me show you how! Firstly, for this method to work, your fabric piece must be perfectly square. So measure carefully as if you are just a little out it just won’t work. My starting square of fabric measured 20″ square. Next step is to make a little mark on each of the four edges of the square. Just a teeny tiny mark that is so small it will stay inside the seam allowances when sewn. I marked a little ‘A’ on both the vertical edges, and a little ‘B’ on the top and bottom horizontal edges. Next, cut your square diagonally making 2 triangles. This is where you are glad that you have marked your fabric edges. Place both ‘A’ edges right sides together and pin in place. As always when using triangular pieces you will have a triangular point sticking out at each corner edge. Just place your fabric centrally on top of each other and don’t worry about these little sticky out points (technical term right there). Take your fabric to your sewing machine and sew along this edge using a small seam allowance of approx 1/4″. Press this seam open. You should now have what my 12 year old son reliably informs me is a parallelogram shape! Now to decide on how wide you want your binding strip to be. I want to finish up with 1″ single fold bias binding. Therefore I will need to my strip to measure twice this (2″) when first cut. Measure out your desired width (in my case 2″) and draw lines of this width along the long edge of the parallelogram. Make sure you are doing this on the wrong side of the fabric. See picture below. You will be able to get several rows out of one piece of fabric. Almost certainly you will be left with an excess strip which is not quite wide enough (seen at the bottom of the photo below). This will be a small amount of waste that can’t be used. Turn your fabric over now and place the two edges marked ‘B’ together. At this point all the lines should match up perfectly. But not for long! Right, this is the tricky bit. You will need to shift your fabric pieces so that the the rows are offset by one. Please refer to the photo below to help you. Basically you will have a sticking out piece of fabric at the top and bottom of your piece now. It doesn’t lay flat nicely now but don’t worry about it – although it feels wrong it is right! Pin these two edges right sides together. You are going to sew along this edge using a small 1/4″ seam allowance again so make sure that your lines will still match up when this seam has been sewn. A good way to check if your lines will match up when sewn is to pop a pin in the line on one side at 1/4″ from the edge and see if it come through the line on the other side. Take it to the sewing machine and sew along your pinned edge using your 1/4″ seam allowance. This can be quite tricky as the fabric will not lay flat, it just feels wrong. Stick with it, it will be o.k! After you have sewn the seam you will notice that your fabric will lay flat again. Take it to the iron and press the seam open as you did before. Now the fun bit! Here you will see why it was important to offset your drawn lines by one. You will now cut along the lines you have drawn in order to get one long continuous piece of bias tape. Take care to only cut one layer of fabric as you go – it’s easy to cut the fabric underneath by mistake. Hopefully you can see that shifting your fabric you almost get a spiral effect as you are cutting it. Had you left your lines all matching up and not offset by one you would have just ended up with lots of loops when you cut it out. I hope this makes sense it is a little difficult to explain. I really think the photographs should help more than my waffle! Out of the 20″ square that I started with I managed to get 200 inches of 2″ wide tape! You could leave it like this of course, or follow the next step to make it into pressed single fold tape. In order to make it into 1″ single fold bias tape I ran it through my bias tape maker with the iron and there you have it! I hope that you will have a go at making this. Do let me know how you get on! After making this tape I used it to finish off my #2017sve gift. Look out later in the month for a tutorial on the secret handmade gift that I made using this bias! I’m so pleased to share this make with you all. Such a pretty little fabric basket that could be used for a number of other uses, and as usual with me – fairly quick to make using small pieces of fabric. Fabric pen (not essential you could use an ordinary pen or pencil if you are careful). Before you start it is always a good idea to iron your fabric. This ensures that your fabric pieces are going to be nice and neat and a perfect size. Cut out the 2 pieces of fabric which you have chosen to be your outer bag, the 2 pieces of fabric which you have chosen for your lining fabric and the 2 pieces of wadding or interfacing. To make your quilting stitches neat, you will need to take your 2 pieces of wadding and mark out a diagonal grid pattern. I started by marking this out using a vanishing fabric marker pen, however my lines disappeared more quickly than I wanted so I decided to use a regular pen for this. Take care if you choose this method that your pen lines will not visible through the fabric. You will also notice that I marked out these lines using an 45 degree angle. Do not just draw them corner to corner as this will result in uneven and wonky diamond shapes when you stitch it. I marked one line first and then used the width of my ruler to make even parallel rows of lines thereafter. If you are using iron on interfacing, you will not need to do this. Simply iron your interfacing to the wrong side of the fabric pieces which are going to be the outer bag pieces. Take one of the wadding pieces and place it on top of the wrong side of one of the fabric pieces which will be the outside bag. Pin in place. Repeat for the other wadding piece and outside bag piece. Take these pieces to your machine and stitch along all of these lines. Take care not to miss any out! Continuing with these pieces, place them right sides together and stitch around both sides and along the bottom edge (leaving the top edge open). I used a 3/8″ seam allowance. Take care if you are using a directional fabric that you are sewing it the right way up! Press the seams open as well as you can. This is a bit awkward and I used my tailors ham/sleeve pressing roll for this. Next you need to pinch the bottom corners in order to make your bag stand up nicely. Pinch each bottom corner to make a triangular shape and pin. Measure 1.5″ from the point and draw a line across at this point. Repeat this for the other corner. This is hard to explain, I hope the photographs help you to understand this. Take to the sewing machine and sew along the lines you have marked. Cut away the excess, leaving a small seam allowance. Great! Then you can turn the bag right sides out. To make the lining bag, place the two lining pieces right sides together and sew along both sides and along the bottom edge – but this time leave a gap of approximately 3″ along the bottom edge. This gap should be large enough for you to pull your bag through at the end. Again be careful if your fabric is directional – think about how it will lay when it is made up and which way up it will sit when the lining is rolled over to the outside, and choose what will be your top edge and bottom edge accordingly. If your fabric has no directional print you don’t need to worry about this. When you have done this you need to pinch both bottom corners just like you did with the outer bag, pin, stitch and trim excess. Again if you can press the seams open at this stage it will look neater when it is finished. Place the outer bag inside the lining bag. The right sides of each bag should be facing each other. Pin all the way around the top edge and take it to the machine and stitch all the way around this edge. Turn the bag over and you will see the 3″ gap that you left open when you made the lining bag. Gently turn the bag ‘right side out’ by pulling the outer bag through this hole. Now it’s time to close the opening in the lining bag. Pin the opening closed and either machine stitch the opening as close to the edge as you can, or hand sew it closed. I chose to machine sew it because I was feeling lazy however this will create a little ‘ridge’ along where you have sewn. It is not particularly noticeable but if you want a neater finish I would suggest you hand sew it using a ladder/slip stitch. Push the lining bag inside the outer bag now and you’re almost there. Pin all the way around the top edge and machine stitch all around this edge. This will stop your outer or inner bag slipping and looking messy. This is the finishing touch and as well as serving a purpose it really gives the bag a professional finish. There you go, you’re all done! You can leave it as it is or roll the top over to expose the pretty lining fabric which is what I will do with mine. I made this basket from 2 fat quarters. There is enough left to make another basket, so if you were using 2 fat quarters maybe you could make one for yourself and one for a friend – after all it doesn’t have to be used for threads only! Thanks for reading! I would love to know if you are going to have a go at making one of these, and what you are going to use it for. The Pleated Zipper Pouch – an online course from The Stitch Sisters.